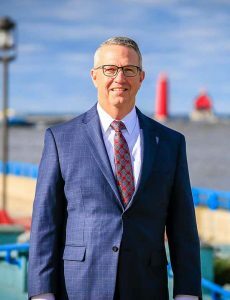 What started off as a summer associate’s stint at Scholten Fant for Bob in 1988, has now matured into a full-time position nearly 30 years in the making. Those seeking intelligent solutions and trusted counsel in matters regarding Family Law, Municipal Law, Criminal Law or Litigation have found the same consistent support from Bob as have the boards of directors he’s served – Habitat for Humanity, North Ottawa Council on Aging (now known as Four Pointes Center for Successful Aging), the Muskegon Catholic Schools Board of Trustees and the Mona Shores Varsity Hockey Club. Bob was born in Muskegon, Michigan and currently lives with his wife and four children in Spring Lake, Michigan.